The Video Lecture Series Jewish Values and the Israeli-Palestinian Conflict explores one of the most divisive issues affecting the Jewish people today. Twelve curricular units on the Hartman Online platform. Units vary in length and format and include one 30-minute introductory lecture, eight 25- to 40-minute lectures, some of which are followed by 25- to 30-minute interviews with experts exploring the complexities of the issues raised in the lecture, and one 40-minute concluding unit comprising expert interviews. 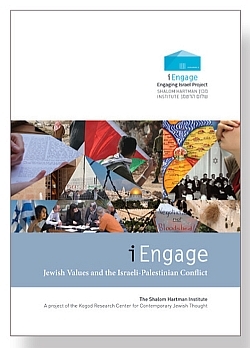 The Israel We Imagine addresses the most essential narratives and assumptions that the Jewish community holds about the Israeli-Palestinian conflict. An understanding of differing positions, resulting from differing visions and aspirations, can foster a richer and more tolerant Jewish discourse about the conflict. Jewish Narratives of Peace explores different models of peace within our sources and the way they affect our vision for a resolution of the Israeli-Palestinian conflict. As one of the principal aspirations of the Jewish people, featured in all of our prayers, what type of peace are we praying for? Attitudes Towards the Land – Perspectives from Within Israel examines the historical and religious significance of the land in Jewish sources and the way this range of perspectives shapes the attitudes of many Jews, especially those in Israel, towards the Israel-Palestinian conflict. Attitudes Towards the Land – Perspectives from Outside the Land explores Diasporic conceptions of the place of land in Judaism and how they shape the way one views the Israeli-Palestinian conflict. Justice explores the central meanings and implications of justice within our tradition and the impact that these understandings have on our moral responsibilities toward the conflict and its resolution. Justice: X Happened looks at the claim that a wrong was perpetrated as part of Israel’s establishment and the ways in which this kind of controversial claim can be addressed in a genuine and morally appropriate manner. Self-Preservation explores the core moral commitment to self-preservation in Jewish tradition and its impact on the way we think about the conflict. Compromise examines the ways in which our tradition views the idea of compromise, its relationship toward justice, the way it interacts with self-preservation, and how it shapes political and moral perspectives on the Israeli-Palestinian conflict. Concluding Conversations – Living with Competing Values brings together iEngage faculty members to discuss how they synthesize the different values addressed in the series. The session models a conversation about the conflict in which values and ideas, rather than politics, take center stage.